Within the specification of an uninterruptible power supply (and similar power protection products) you will often find a small rating for their enclosure such as IP20. This term or value is fairly common across the industry and is part of an enclosure rating system defined according to BS EN 60529:1992, European IEC 60509:1989. An IP rating defines the degree of protection of an enclosure from intrusion by body parts, dust, accidental contact or water. The rating system is also referred to as the International Protection Rating system. IP20 is the standard accepted rating for a number of office, IT and electrical product enclosures. IP ratings higher than IP20 can be achieved and these are typically provided for marine, off-shore, industrial and out-door UPS system operation. For example for an industrial manufacturing or outdoor renewables application an IP rating of IP54 or IP55 may be required. An IP rating will consist of two numbers. The first indicates the degree of protection from moving parts and foreign bodies. The second defines the protection level of the enclosure from moisture, drips, sprays and submersion. The standard UPS system enclosure has an IP20 rating. As soon as the IP rating is raised the the system becomes a custom UPS (bespoke UPS) as the product’s enclosure requires modification during or after the main manufacturing process. Sometimes this can be achieved through the simply addition of a metal cover (or hat) to prevent water ingress from above. Sometimes the product requires placing in a higher IP-rated enclosure. The effect of raising the IP rating is two-fold. Firstly, the cost price will rise as additional works and material are required to the standard product. A higher than standard IP rating can double or treble the cost of a small UPS system (up to 10kVA). For this reason it is often common to place such a system in a nearby control panel if possible. This allows a standard IP20-rated product to be used but provides the UPS with a higher degree of protection. Secondly, the lead time will rise and for a standard off-the-shelf product this can increase to 3-4 weeks. Why? The higher IP-rated enclosure may require manufacture itself and not be a stock item. In addition it can also take a few days to raise a quotation for a high IP-rated enclosure which may have to be costed on a project-by-project basis. A final point to consider is ambient temperature. The battery set within a UPS system is designed for a 20-25 degree ambient temperature. If the UPS and battery is placed in a higher IP-rated enclosure, forced ventilation may be required to prevent early battery failure. Most UPS systems themselves will operated up to around 40 degree ambients but humidity has also to be considered if this will create a high level of air-borne water content within the enclosure. This is a common issue when systems are operated in high ambients during the day but with very cool night time temperatures such as deserts and other remote regions. An additional consideration for UPS systems to be used off-shore is not just moisture but component corrosion from salt-water ingress. Containerising a UPS system is the ultimate form of enclosure protection. This is more common for larger three-phase UPS systems which may also be installed with a back-up generator and all the necessary switchgear and cooling. Again a standard IP20 system can be used with the container itself providing the ideal protection level required. Costs and lead times do of course rise in this type of UPS arrangement. 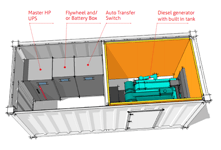 See the Riello PowerBox UPS for a leaflet on containerised UPS systems. EcoPowerSupplies can provide any range of IP-rated system through our custom UPS manufacturing facilities including containerised or industrial UPS and custom solutions.